March Madness more closely resembled Outright Lunacy when Gonzaga and BYU staged an indoor track meet that passed for basketball Tuesday night at the Orleans Arena. By game’s end, it was difficult to determine who was more exhausted: The players, the fans or the scoreboard operator. 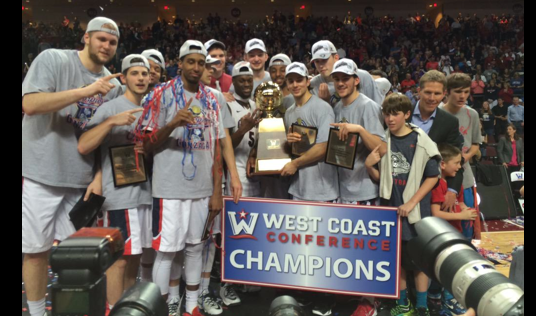 Gonzaga’s players, accustomed as they are to winning, summoned enough energy to celebrate with one another and their Zag Nut fans as confetti rained down on the Bulldogs after they won the West Coast Conference tournament for the third straight year. “It was just a great basketball game, played with a lot of possessions,” Gonzaga coach Mark Few said after an impressive 91-75 win. “A lot of heart showed by both teams. The Gonzaga team that wobbled a bit late in the regular season looked very much like a national championship contender against BYU. The Cougars played gamely and well, but Gonzaga played superbly before a raucous sellout crowd of 8,585. As usual, the crowd consisted largely of Gonzaga fans, many of whom make the trip to Las Vegas every year for the tournament. “To see that kind of support is inspiring,” Few told fans after the game. The seventh-ranked Bulldogs (32-2) won’t know until Sunday afternoon where they’re playing, how high they’re seeded or who they’ll open against in the NCAA tournament. The smart money has the Bulldogs drawing a No. 2 seed and opening in Seattle or Portland. It’s the 17th consecutive trip to the Big Dance for Gonzaga, a truly remarkable accomplishment for a program that not all that long ago was scheduling the likes of Whitman, Western Montana and Eastern Oregon.